Info "Fly, little angel! Avoid the enemy attack!" Kid Icarus is one of 9-Volt's microgames in WarioWare: Twisted! It is set in the NES game of the same name. The object is to have Pit avoid the Eggplant Wizard's attack. 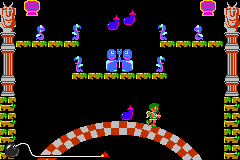 If the player gets hit by an eggplant or a Shemum touches them, the screen cuts to black with text saying "I'm Finished!" and the player loses the game. Level 1: One Wizard throws eggplants. Level 2: Two Wizards throw eggplants, plus a jar releases Shemum. Level 3: Two Wizards throw eggplants, plus two jars release Shemums. This page was last edited on November 16, 2018, at 21:58.